The Pacific Legal Foundation filed an appeal Monday asking the Supreme Court to hear a new challenge to the Affordable Care Act which argues that the ACA’s taxes are unconstitutional because they originated in a bill written by the Senate. Under the Constitution’s Origination Clause, all bills that levy and raise taxes must begin in the House of Representatives. 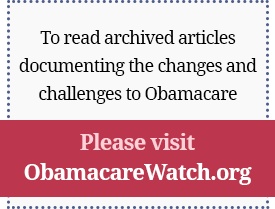 Contrary to this provision, the text of the ACA was written by the Senate and later adopted by the House. Senate Majority Leader Harry Reid gutted an unrelated House bill, leaving only the bill number, and in its place, he inserted the 2,076 pages of the ACA. The PLF contends that the ACA’s taxes were therefore unconstitutionally created in a bill written by the Senate. In 2012, the Supreme Court decided in NFIB v. Sebelius that the individual mandate, a requirement in the ACA forcing Americans to purchase health insurance or else pay a penalty, is indeed a tax. The Supreme Court did not however address the implications of the Origination Clause on this conclusion. PLF’s lawsuit, Sissel v. U.S. Department of Health & Human Services, specifically targets the individual mandate to prove that all of the ACA’s taxes are unconstitutional under the Origination Clause. Four of the nine justices must vote to hear the case before it is placed on the court’s docket. View PLF’s petition for writ of certiorari here.